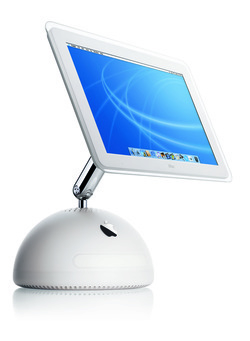 The Apple iMac G4/800 17-Inch (Flat Panel) features an 800 MHz PowerPC 7445 (G4) processor with the AltiVec "Velocity Engine" vector processing unit and a 256k on-chip level 2 cache, 256 MB of RAM (PC133 SDRAM), an 80.0 GB Ultra ATA/66 hard drive (5400 RPM), a tray-loading "SuperDrive", and NVIDIA GeForce4 MX graphics with 32 MB of DDR SDRAM (AGP 2X support). Details: Shipped with a "NVIDIA GeForce4 MX graphics processor with AGP 2X support". Details: This model has a 17.0" TFT active matrix display with a native resolution of 1440x900. It also supports "1152 by 720, 1024 by 640, and 800 by 500 pixels at 16:10 aspect ratio; [and] 1024 by 768, 800 by 600, and 640 by 480 pixels at 4:3 aspect ratio." Apple reports a "typical" brightness of 200 cd/m, contrast ratio of 300:1, and viewing angle of 120 degrees horizontal and 90 degrees vertical. However, the hardware is capable of using an external display in dual or "extended desktop mode", Apple just blocked the capability in firmware to protect sales of more expensive Macs. Unsupported third-party hacks are available. Details: This model supports hard drives larger than 128 GB. Ultra ATA/100 hard drives are backwards compatible with the Ultra ATA/66 standard. Details: *In inches - height x width x depth - minimum (33.1 cm, 42.3 cm, 27.0 cm). The maximum dimensions are 20 inches x 17.7 inches x 16.7 inches (50.9 cm, 44.9 cm, 42.3 cm).